The rationale behind this design uses the simple key to designing advertisements that sell: keep all eyes on the product. The goal, through pictures and composition was to make the wind activated kinetic sculptures speak for themselves. Into the layout montage I crafted drama, impact and interest. The only words in the brochure are the philprice.co.nz URL embossed in relief on the polished carbon fibre cover of the clamshell which the client designed and fabricated. Below the URL on the cover is a small authoritative Phil Price monogram logo. 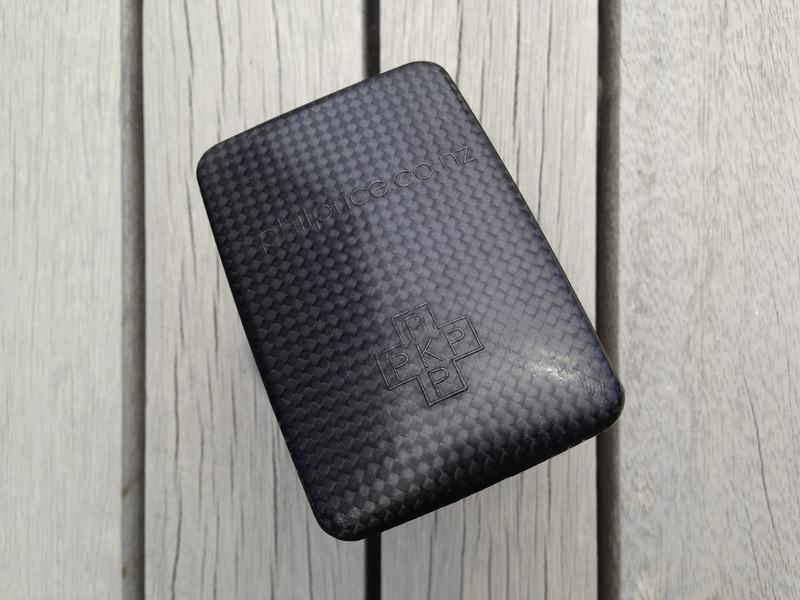 The carbon fibre case was designed by Phil Price, fabricated using CAD and an aluminium mold. The ‘natural’ carbon fibre fabric was hand polished for an aesthetic look and feel. It’s so easy with a flier design to think cheap and downgrade the client’s valuable, irreplaceable, hard-won image. The concept of the carbon fibre case and novel pocket-sized format was well accepted by the client and he took on the task of making the business card sized clamshells by hand to help overcome this trap with a strong, tactile first impression that appeals directly to everyone’s love of novel new things. The 18 panel unfolding story allows the wind-activated kinetic sculptures to speak for themselves. If you happened upon one of Phil Price’s large wind-activated kinetic works you’d see slick, beautifully modern forms, and fascinating lively movement. It is easy to see how photos of the works in the context of their urban and park-like surrounding communicate what is in Phil’s mind’s eye so that his readers can see the kinetic works as clearly as he. The works that feature on the first page are Protoplasm, Fulcrum, Tri, Cytoplasm, Ratytus and Morpheus. They are located in Auckland’s Viaduct Basin, Wellington, Waiheke Island, Christchurch, in New Zealand and Bondi in Australia. 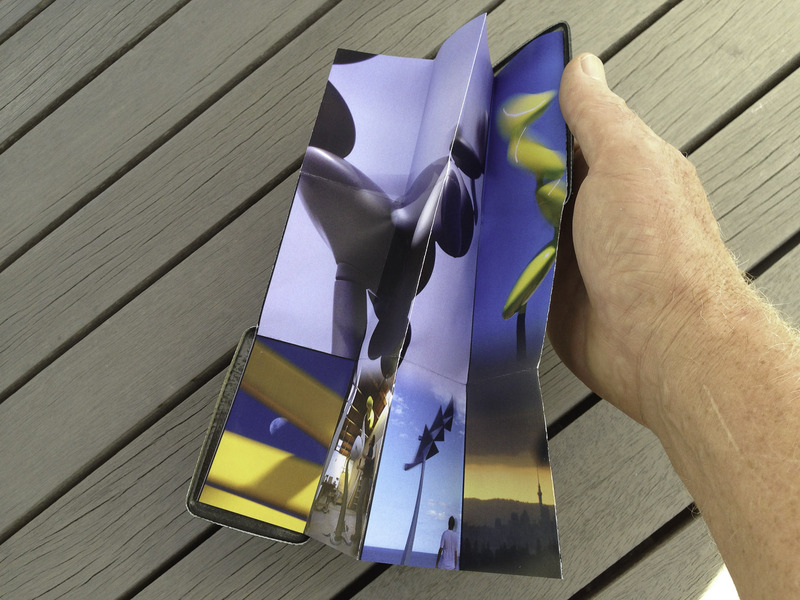 This single-sheet visual brochure is a wee beauty that gets thirty six pages of work out of just one. From it’s business card sized 95mm x 50mm bespoke clamshell case, a story unfolds in a natural, easy-to-follow sequence. The key to the design was to think of it as a visual catalogue of works rolled into two a4 fliers or mini posters. It was easy to design and inexpensive to print digitally. Perfect for Phil Price’s trip to exhibit one of his kinetic works in the Sculpture by the Sea group exhibition near Aarhus in Denmark in July of 2009. 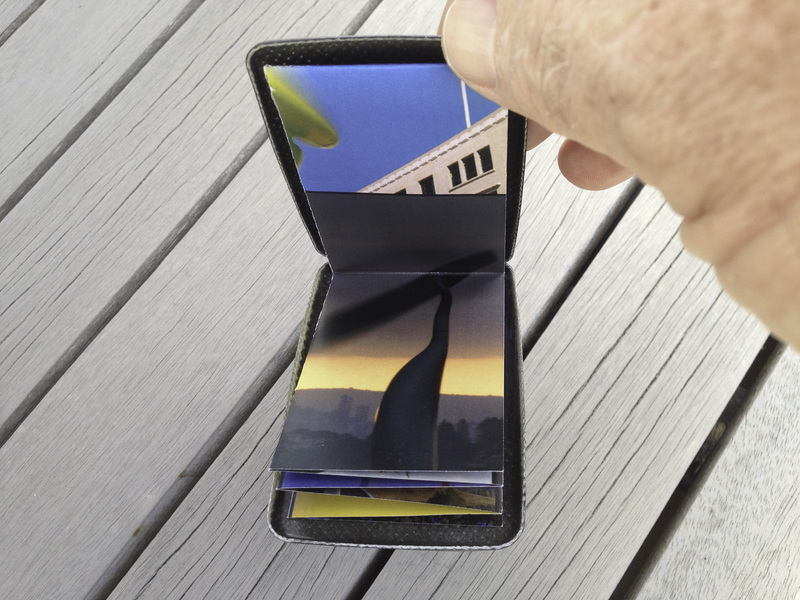 It slips easily into pocket or purse, and the pictorial format was ideal for telling the story of Price’s kinetic works in general and showing selected images of the 9m tall “Morpheus” work exhibited in Denmark as work-in-progress I shot in the sculptor’s Christchurch studio. 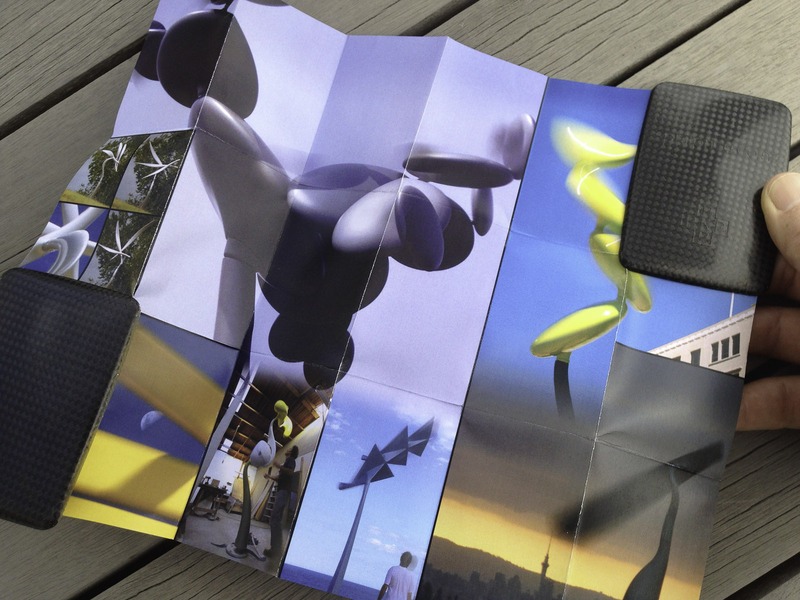 The brochure folds open like a story with a visual theme that reveals one kinetic sculptural work at a time laid out in an interleaved montage. Each column of panels unfolded contains a teaser of the next work to be revealed by unfolding the sheet in 4 steps. The very precise folding necessary was achieved using a precise and reliable pharmaceutical package leaflet folding machine of the sort used to fold the leaflets enclosed with all medication. The kinetic works featured on the verso of the brochure are Nucleus, Dodo, Pipi, Cassini, Protoplasm. They are located in Christchurch, at the Fulcrum one man show at Amisfield vineyard near Queenstown, Queenstown and Waiheke Island’s Sculpture in the Gulf. The fully opened sheet has room to elaborate on the diverse forms of Phil’s kinetic works. 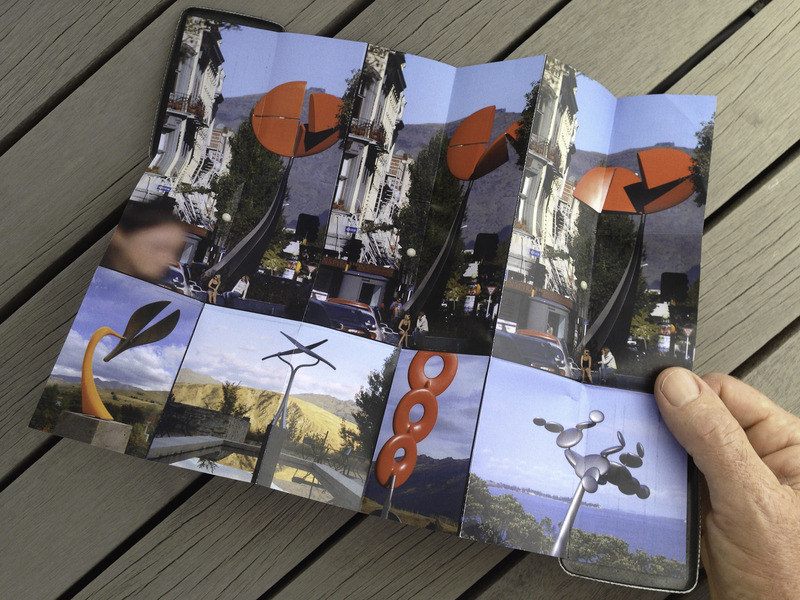 It is no longer pocket size, but the theme continues—big images, vibrant colours. Phil Price ‘Morpheus’, composite materials and stainless steel, 9m at Sculpture by the Sea, near Aarhus, Denmark, 2009. 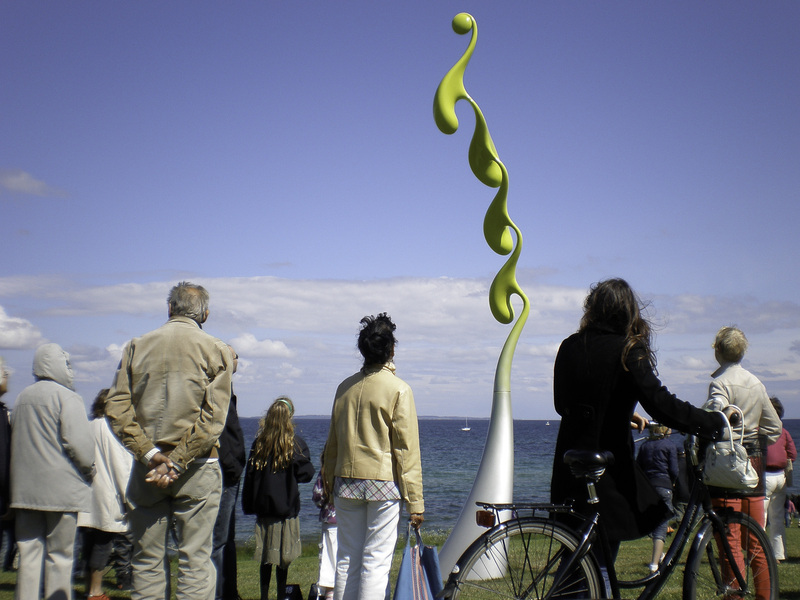 While Mr Price’s wind-activated kinetic works have proven very popular with their private collectors and the public around the world, for example works like Morpheus winning a clean sweep of the “people’s choice” awards at exhibitions like the 2009 Sculpture by the sea in Denmark, the audience who commission and buy outdoor kinetic sculptures is a niche market. The advertising visualised those few who are very interested and presents his works to them. By maintaining poise, showing, not telling about Phil’s excellent works, the art buyer is led to his website for more information, this is the call to action of the piece. Dress well. Be clear. Make your point. The private collectors, corporate and civic art buyers are an intelligent and preoccupied audience, the flier’s message is concise and does not waste their time. Artists do not want their work to be sold in the retail sense and art buyers don’t want to receive a sales pitch for a commodity. As collectors, investors or developers they actually sell themselves. People like beautiful well made things and they like the people who make them, the relaxed tone of this engaging advertisement makes for a win-win transaction.